This novel is not only based on Jules Vernes’ classic, Journey to the Center of the Earth, but also pays tribute to several of Édouard Riou’s classic illustrations from the 1864 version, which are now in the public domain. The illustrations in this book are, of course, our own versions, and this Mandarin Companion graded reader has been adapted into a fully localized Chinese version of the original story. The characters have been given authentic Chinese names as opposed to transliterations of English names, which sound foreign in Chinese. The locations have been adapted to well-known places in China. The translation of the title is worth pointing out, because it’s the standard translation used in Chinese, and it’s a good one, but why it’s good might not be obvious to an intermediate learner. 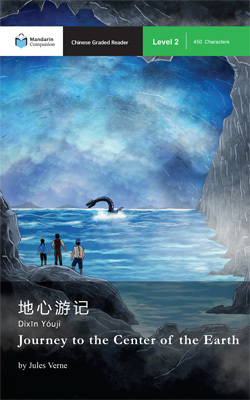 The title Dixin Youji mirrors the title of one of China’s Four Great Classical Novels, Xi Youji, or Journey to the West in English. So while “youji” is not a word you’ll use in your everyday conversations, when it comes to Chinese book titles, it must be learned. The original story focuses on the German professor Lidenbrock and his nephew Axel. That story begins in Hamburg, includes a rather long build-up with lots of characters, and eventually traverses to Iceland for the descent, where Icelandic guide Hans joins the expedition. In this adaptation, the locations have been adapted to Xi’an as our heroes’ starting point, with the mountainous region of Le Shan (near Chengdu, Sichuan) as the point of descent. Perhaps the biggest change to the story was replacing the nephew Axel with a niece named Xiaojing. We saw no reason that the lead role couldn’t be female, and it makes for easier identification of the characters in illustrations where the characters are smaller. As one of the oldest stories that we have adapted at Mandarin Companion, we have been extremely impressed by how well Verne’s classic sci-fi tale holds up even for modern-day readers. The following is a list of the characters from Journey to the Center of the Earth in Chinese followed by their corresponding English names from Verne’s original story. There are, of course, other characters in the story besides these, but many do not have exact correspondences to the original. The names below aren’t translations; they’re new Chinese names used for the Chinese versions of the original characters. Think of them as all-new characters in a Chinese story. Announcing the Launch of Our Podcast! ‘Emma’, ‘The Prince and the Pauper’, and ‘The Ransom of Red Chief’ Now Available on Kindle!